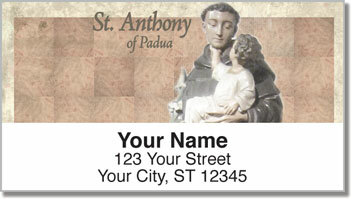 These Christian return address labels feature four great men of God who became saints because of their dedication to serving others. 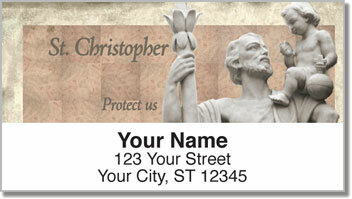 You'll find St. Christopher, the patron saint of children and St. Peter, the patron saint of workers. 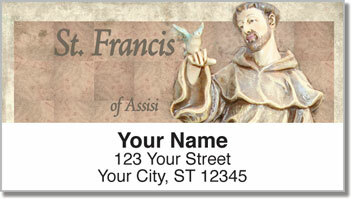 There's also St. Francis, the patron saint of animals and St. Anthony, the patron saint of lost things. Express your faith and give your mail an inspirational finishing touch when you choose this unique design. Plus, you'll be pleasantly surprised at how quick and easy the task of preparing letters and packages will become. That's because of the convenient, self-adhesive backing, which lets you simply stick a label on each envelope. 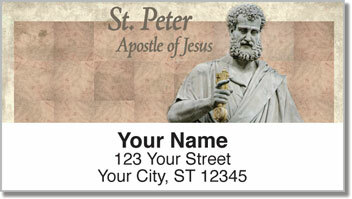 Order your own Christian Saint Address Labels today! You can also find a design of matching personal checks.